A china cabinet may be used for storing or displaying tableware or other items. On ArchiExpo, such furniture is arranged by properties including style or material. These pieces are found in homes, restaurants, bars and other professional environments. Some have flexible shelving, built-in lighting, a mirrored back, drawers for cutlery or glass doors, putting the contents on display. 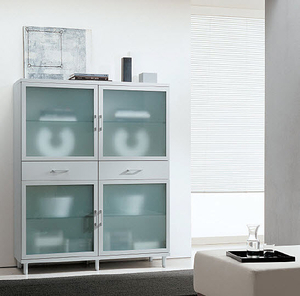 Glass, laminated particleboard, solid wood and other materials are used to make these cabinets. Determine the number and size of items to be stored, and verify that the cabinet can support their weight. Choose a glass front it the contents are to be displayed. Consider maintenance requirements and how the style of the cabinet affects it surroundings. It may match or contrast with other furniture.